Health can bridge the political. At its core, it is a fundamental cry of the humanity in all of us. Disease does not discriminate nor does sickness pledge partisanships. Only we do. The sixty-seventh World Health Assembly, housed by the WHO and the United Nations Foundation, focused on this mutual, worldwide aspiration for health as both a governmental tool and an individual right. Attended by delegates from all WHO member states, the conference housed technical briefings, debates, and discussions surrounding global health issues like nutrition, universal health coverage, patient’s rights, and non-communicable diseases. Underscoring the majority of these topics was the growing concern of the rising incidence of attacks on health care workers. On the World Health+SocialGood channel—an online platform developed by the WHO and UN to bring about beneficial change via social media—Christy Feig, Director of Communication at the WHO, led two different interviews that elaborated on the Technical Briefing, “Health Care Under Attack: A Call for Action”. Among those interviewed were Ms. Valerie Amos, The Under-Secretary-General and Emergency Relief Coordinator, Dr. Rudi Coninx, Coordinator of Emergency Risk Management and Humanitarian Response, Dr. Rick Brennan, Director for Emergency Response at the WHO, and Pierre Gentile, Head of Health Care in Danger Project at the International Committee of the Red Cross (ICRC). Her analogy is fitting, especially given the alarming rate of attacks. Given the explosive nature of such conflict-zones, some may argue otherwise, however. They say that in such volatility there are reasons for the targeting. A hospital may be seen as a military vantage point, a place where artillery should be fired or a barracks should be placed. Insurgents from one opposing group or another may be housed in the hospital. An opposition party may support the hospital itself, and thus ‘warrant’ an attack. His despondency is not some banal consequence grounded in impossible expectations. The UN Charter of Rights and Freedom, to which nearly all countries are signing bodies, seemingly guarantees rights such as the right for health. These lofty goals, while often nebulous in their application, are the concrete aspirations of all citizens in all countries. Gentile responded implicitly to Brennan’s almost crestfallen statements. Instead of reiterating the special status and protection decreed to health-care personnel and lamenting the lack of respect given therein, he instead focused on what those working in conflict zones can do. Summarizing the ICRC’s data collected in the Health Care in Danger Project, he identified measures that could be widely be disseminated to improve the situations of health care workers and health facilities. He also admitted that much of the safety relies on working contracts with the government to provide security forces. While these suggestions were key in directing the technical briefing to some form of a coherent plan, what became plain was the public health consequences of such degenerate targeting: when healthcare is under attack, everything is. Conflict breeds out of lack of health but what is less known is that the lack of health caused by the attacks on humanitarian workers will only perpetuate the conflict to no fixable end. By targeting those most vulnerable, not only is there a loss of Brennan’s “morals”, but a loss of the very practical mechanism in order to get better. Health cannot be guaranteed. Only sickness can. And without the possibility to get better from sickness, with the indiscriminate targeting of infrastructure that supports the betterment of the situation at its most fundamental level, then no matter the supposed reason for a conflict, little will be achieved. Healthcare serves to provide the foundation of a functioning state. Without it, the state will dissolve into a coughing fit. And by then, when the rubble fades, it may be too late to search for a salve, military or medicinal. Link to the event. It was hosted from the 19th to the 23rd of May 2014. 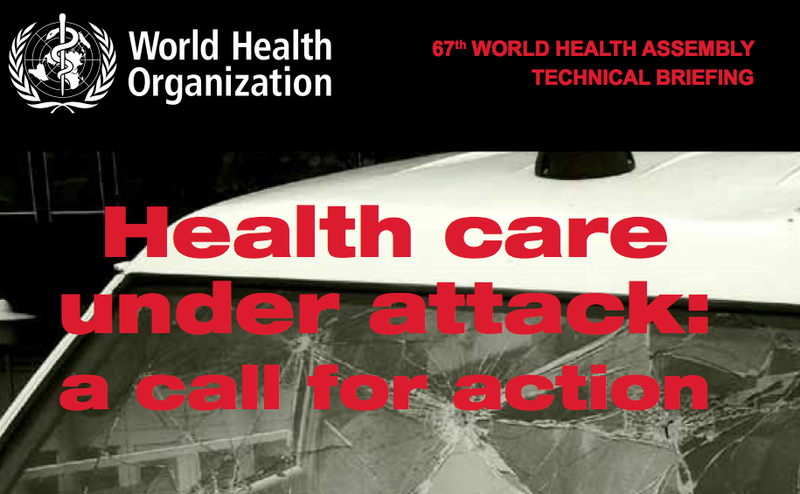 Find out more regarding healthcare under attack. Kacper Niburski is recent graduate from McMaster University, Hamilton, Canada.